A fine cast can enliven a dull story and dull cast can kill a good one. When outstanding actors land in a sharply original story, the results can be explosive. That happens in Puzzle. Don’t miss it. The movie opens on Agnes (Kelly Macdonald) as she is swamped by domesticity while cleaning the family house and preparing a delicious birthday dinner. She then summons her husband Louie (David Denman) and their children. But wait, whose birthday is it? It’s hers. That is precisely how director Marc Turtletaub tells us in one quick scene that Agnes does all the work for the family without anyone else lifting a hand. But here’s what creeps up on us very gently. Agnes is not resentful. It’s her work. Louie loves his family and his home and when he comes home from working in his auto shop, he is thoroughly happy to be with the people he loves. Acceptance by all is the atmosphere. When Agnes starts assembling the pieces of a birthday present puzzle, we realize we are watching a woman discover that her brain can see the whole in a pile of pieces. We all know instantly that she has found something she must follow. Off she goes to New York City – where she has never been – to a serious puzzle store to begin to learn about her new world. While there she sees an ad from a gifted puzzle man who needs a partner for a championship. She replies, meets Robert (Irrfan Khan) who is stunned by her ability and invites her to join him. In any other movie we would expect to see any number of plot twists involving resentment, jealousy, affairs and the like, but this isn’t that kind of story. For a long while the two new partners prepare for the championship. This is about two oddly gifted people who grow close on the oddest of paths. The movie is so full of genuine, unspoken emotion, of kind people oddly matched, of two destined to be together – or are they? In this family full of respect and love for each other, none of the ordinary plot twists unfold. By the time we have learned not to expect the obvious, we are enveloped in the fascination of watching Agnes deal with her genius as she steps into a bigger world. The team that built this piece of art includes director of photography Chris Norr, writers Oren Moverman and Natalia Smirnoff (original story), director Marc Turtletaub and the cast who understood the quality of their undertaking. Kelly MacDonald should be honored for responding with such subtlety to the whole of the film that she carries. And Irrfan Khan gets an equal bow for his ability and extraordinary restraint as her puzzle partner. The story becomes Agnes’ search for who she really is. 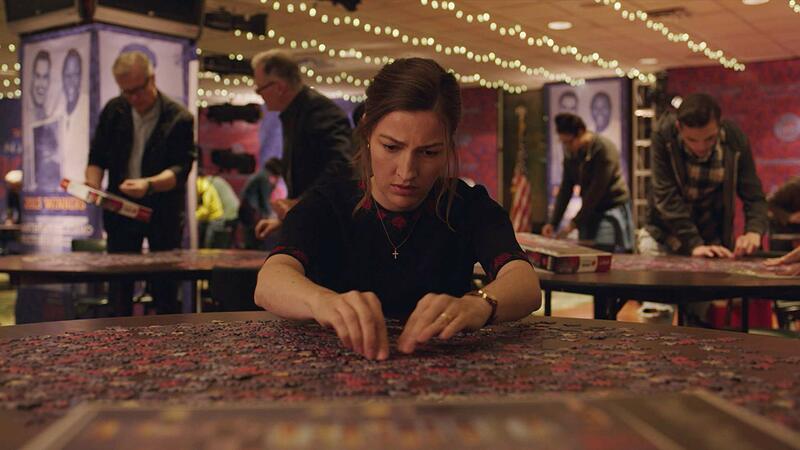 Because of the quality of acting, directing, writing, and lighting on all levels, ordinary superlatives do no justice to Puzzle, a movie that is a work of art. This review was posted on August 11, 2018, in Drama. Bookmark the permalink. Search from a list of over 1000 reviews by title. Her opinions are yours to consider, yours to quote. Click here for a complete list of past reviews.